Hand reared birds can make excellent pets. They can be very active with great personalities. If raised and handled properly they’ll be your friends for life. Here are a few tips to get your birds started in their new home. 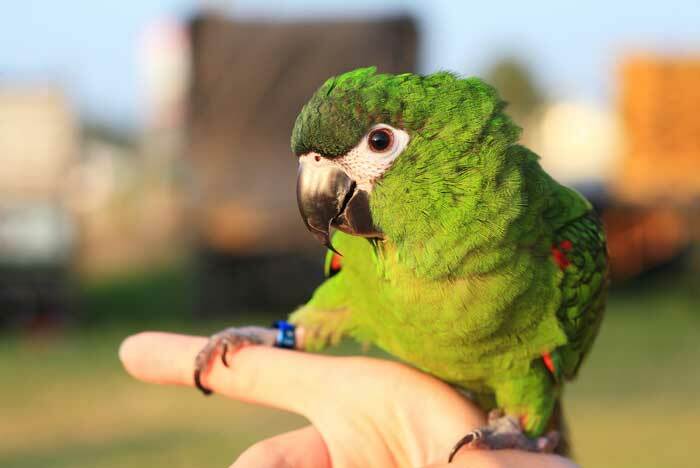 Most small parrots and conures have a life expectancy of between 20 to 30 years. They are sociable birds and like to live together with their own species, but if they are properly tamed and become part of the family it is not essential. It’s cruel to keep a bird in isolation if it won’t tame. If you can’t handle it regularly then please introduce another bird of the same type. Allow tame birds to settle in for 24 hours before letting them out. Exercise is essential, let them have a supervised wander around indoors as often as possible, if their wings are clipped make sure they are returned to their cage every hour for food and drink. Handle your birds as often as possible, when picking them up make sure their wings are held close to their bodies. A member of staff will show you how. Keep your birds indoors out of direct sunlight, in a room with a steady temperature and no draughts. A bedroom or lounge is ideal. A few toys are essential to keep them amused. Please don’t overcrowd their cage with them. A few toys are essential, especially when keeping a bird singly. Please don’t overcrowd their cage with them. We recommend: Johnsons Bird Clean ‘n’ Safe, Pet Bird Toys, Pet Bird Treats, Naturals Parrot Woodroll. Hand reared birds can get mites and lice in their feathers. There are sprays available to treat this. Cage or aviary: Hand reared birds need a lot of room. The minimum suggested cage size for 2 small hand reared birds is 61cm x 40cm x 65cm. The bars should be narrow enough so they can’t get their heads stuck or escape. Cover your bird cage at night so they can sleep in peace. Perches: The perches should be the correct diameter for their feet. Position them so your birds can reach their drinkers and feeders, and turn around on them without touching the top, bottom or sides of the cage. Play stand: These are useful to keep your birds amused and in one place when out of their cage. Drinker: Make sure the spout is wide enough for the birds’ beaks. Change the water daily to keep it clean and monitor their drinking. Food: As different birds have varying nutritional requirements, a member of staff will advise you which complete food is appropriate for your birds. Loose seed that has been bagged in-store is not complete so you’ll need to use nutritional supplements. It is vital that animals are weaned gradually onto any new food. Bird bath: Occasional bird baths are essential for hand reared birds to bathe in although some prefer being sprayed. This will help them to preen, there are plume sprays available for this.